When we first wrote about Bologna's shoe factory C.L.A.M.S. (Calzature di Lusso Artigiane Mercatali Sauro - Artisanal Luxury Footwear Mercatali Sauro), we barely managed to recover some photos from vintage trade magazines. 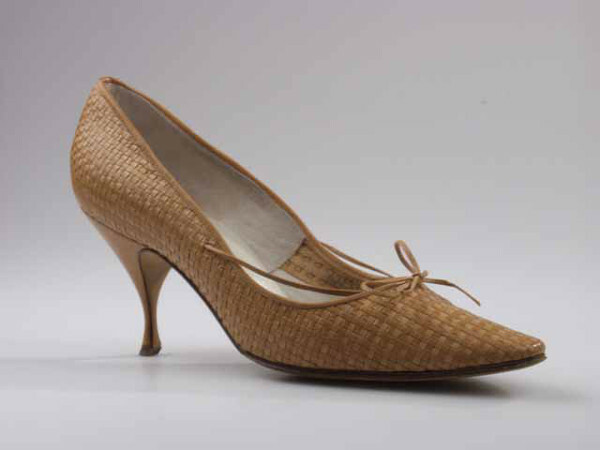 Now, thanks to Inge Specht-den Boer, Nederland Leder en Schoenen Museum's curator/PR we can appreciate an actual model: a woven leather décolleté with a gorgeous needle heel.